Cartilage is the material that covers the ends of the bones that meet in our joints. Cartilage is smooth, but it's also durable and flexible. Osteoarthritis is a condition that gradually breaks down the cartilage in a joint, resulting in painful or limited movement. This condition, also called degenerative arthritis, is common in the hip due to the hip often taking the body's weight. Because cartilage normally makes movement while carrying your body's weight load a smooth process, wearing away of the material can result in painful and limited motion. Without treatment, the end of the femur bone may end up rubbing against the bone of the hip socket, without cartilage between them. This rubbing of bone against bone can create bone spurs or other abnormalities at the joint's edges. 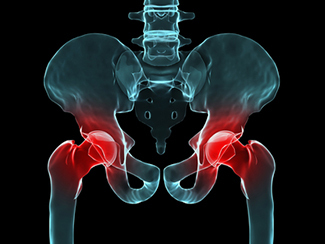 What causes Osteoarthritis of the Hip? Degeneration of cartilage occurs naturally in joints from everyday wear-and-tear as we age, but trauma, injury or repetitive motion can speed up the degenerative process. Older people, women, and those whose occupations an increased weight load on the hip are at a higher risk of developing osteoarthritis of the hip. Obesity can increase the amount of stress placed on the hip, which can make developing this condition more likely. Sometimes preexisting conditions or genetic predisposition can also increase the risk of this condition. Osteoarthritis of the hip symptoms vary according to the degree it has progressed. Common symptoms can include knee, inner thigh, buttocks and hip pain that might increase with movement. When walking, you may feel a grating sensation in the hip. Avoiding movement to avoid pain can result in muscle weakness around the joints, which can cause a limp. A sensation of tenderness may be felt when pressure is applied to the hip. Stiffness of the hip may also be present, which can affect your normal range of mobility in the legs. This condition may be diagnosed by your doctor after a review of your medical history and a physical exam. An imaging study like an X-ray may be used to determine the extent of damage. How is Osteoarthritis of the Hip treated? As with many other degenerative conditions, treatment options depend on the severity that the osteoarthritis has advanced to. Conservative treatments like non-steroidal anti-inflammatory medication, physical therapy, and corticosteroid injections may be beneficial in the early stages of the condition. Weight loss and shoe orthotics may be recommended by your doctor to reduce the amount of stress placed on the joint. If conservative treatments do not help and deterioration of the hip continues, surgical repair of the joint may be necessary.